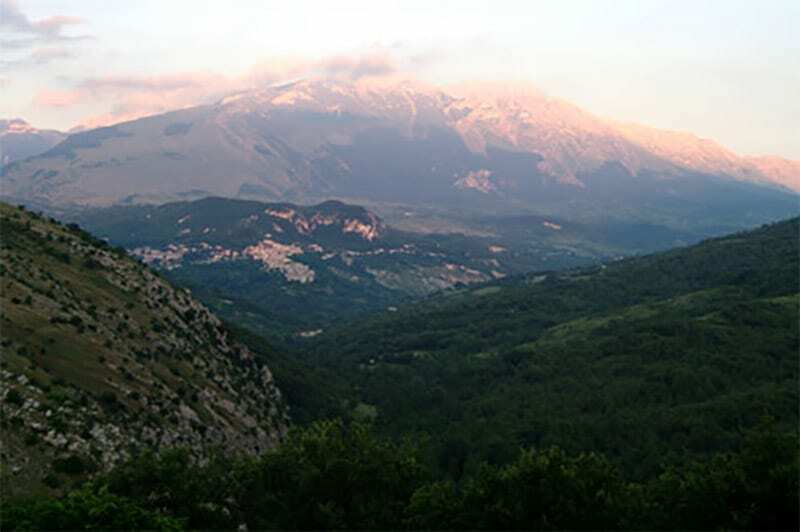 My father was born in Salle, a tiny village tucked within the rugged mountains of the Parco Nazionale della Majella in Abruzzo. He immigrated to the United States with his parents and younger brother in 1966, part of a devastating exodus of nearly two-thirds of Salle’s inhabitants during the 1950s and 60s. Although my dad’s childhood stories often speak of extraordinary hardship, they are also woven with tender, almost dreamlike nostalgia for his hometown. He and Sallesi throughout Italy and across the globe have remained fiercely loyal to their patria and each summer, the town’s population swells as so many return home. Salle is a sleepy village of about 300 inhabitants and in many ways, it feels like time has stood still. Old women dressed in black are the town’s watchmen, demanding the identity of those unknown to them. The first time she ever visited Salle, my Sicilian mother was stopped by one of the town elders and asked, “Signora, a chi appartiene? – Who do you belong to?” The town has only one tiny general store and the locals rely on trucks peddling their wares for fresh bread, cheese and produce. Salle’s social life revolves around the piazza and the Bar da Pasquale, which serves libations to the old and gelati to the young. Our house is a stone’s throw from the home of Nonno Stefano, my great-grandfather and the benevolent patriarch of my dad’s family (for whom my middle son is named) and although he passed many years ago, the makeshift green bench he built still sits outside the door. When I was a young girl, I loved visiting Salle. A city kid, it was probably the only place on Earth where I could walk down the street at seven years old without my mom’s firm grip on my hand. The first time I anxiously asked my parents whether I could go to piazza by myself, I looked at them like they had gone mad when they answered yes. Unfortunately, but not surprisingly, Salle began to lose its allure when I became a teenager. The smallness I had found so liberating instead felt suffocating. In the years that followed – during college, law school and even after I was married – despite traveling to Italy a dozen times, I didn’t visit Salle, favoring instead the art cities of Northern Italy, the bustle of Rome, and the romance of Tuscany. I finally returned when my first son was 10 months old and for whatever reason, the bold beauty of its setting, with mountains welcoming me at every turn, took me completely by surprise. That first trip back, with my new little family, was incredibly special, one of those full-circle experiences you start having when you become a parent. Two more sons have since arrived and Salle has become our family’s summer playground. Our kids have made a group of friends who taught them to play Il Lupo Mangia La Frutta despite the language barrier. They participate in the annual Giochi Popolari, which culminates in La Gara degli Spaghetti – a spaghetti-eating contest. They know the ins and outs of the town on their bikes and play “pallone” in the street until midnight. They experienced their first-ever hike up to Salle Vecchia, the old village where their Nonno was born. This past summer, while having dinner in our friend Antonio’s garden, our seven-year old son Mikey nervously asked us whether he could go to piazza with his friends. Disbelief crossed his face when we said yes, and as we watched him walk down the street, we felt thankful that our sons have a special place where they can enjoy a simpler, freer way of life and live their family’s history. Travel Information: Salle is located within the Parco Nazionale della Majella, at the foot of Monte Morrone. Visit the 11th century castle in Salle Vecchia, an uninhabited medieval hamlet that was destroyed by an earthquake in 1933 a few kilometers from the modern town. There is a lovely courtyard and fountain and the views of the Majella and the nearby village of Caramanico Terme are breathtaking. In the modern town, let your kids blow off some steam in the piazza, which is completely enclosed and free of automobile traffic – perfect for an impromptu soccer game and enjoying a gelato from the bar. The daughter of Italian immigrants, Michelle grew up with a strong sense of her Abruzzese and Sicilian heritage. She returns to her father's native Abruzzo with her husband & 3 sons each summer, where she uses their family home in Salle as a base for exploring Abruzzo and other regions of Italy. A corporate attorney for nearly 10 years, Michelle turned her passion for Italian gastronomy and culture into a "second-chance" career cooking and writing about Italy's regional foods through her food and catering company in New York called Majella Home Cooking. As you might guess from my last name, I have ancestors from Salle, although my grandmother and grandfather came from nearby Pacentro. I wish lifeinabruzzo could do a feature on Pacentro, just once. I am so happy to finally see something written about Salle. My father was born there in 1895. My mother's father and mother came from there also. I have never been to Salle and feel sad about that. Thanks for the article. Michelle: This is one of the most beautiful things you have ever wrote!!! Complimenti!!! !